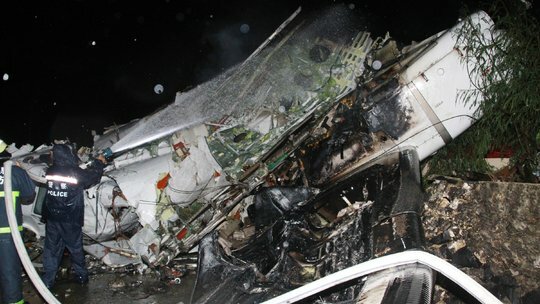 At least 48 people died after a passenger plane crashed in Taiwan’s Penghu archipelago, amid stormy weather in the area. The plane, carrying 58 people, crashed into buildings after a failed attempt to land at Magong airport. The other 10 people on board were hurt. Two French nationals were among the dead, officials said. No crew members are thought to have survived. Family members were flying to Penghu on Thursday, Taiwan media said. Minister of Transportation Yeh Kuang-shih and aviation officials also flew to the island to start an investigation into the disaster, Taiwan’s CNA news agency said. The ATR-72 TransAsia Airways plane crashed as it flew from Taiwan’s southern city of Kaohsiung to Penghu, a popular tourist destination in the Taiwan Strait. Magong is the main city in Penghu, which consists of a main island and several smaller islands off the west coast of Taiwan. It was Taiwan’s first fatal air crash in more than a decade and came after Typhoon Matmo struck, bringing torrential rain and high wind. The plane crashed on its second attempt to land at the airport. It lost contact with controllers after telling them it was going around again. The aircraft then came down in Xixi village outside the airport. Images late on Wednesday night showed firefighters dousing flames at the scene and and using torches to rescue injured passengers. Five Penghu residents were injured on the ground but by Thursday morning all had been discharged from hospital, the Civil Aeronautics Administration (CAA) said. Official said visibility at the time of the crash was one mile and within acceptable standards for landing, despite the storm. Airline representative Phoebe Lu told the Associated Press news agency that TransAsia suspected that typhoon weather had caused the crash but was awaiting the results of the investigation. But Jean Shen, director of the CAA, said nine flights travelled that route between 14:00 and 19:00 on Wednesday. “The weather reports showed it was totally OK for landing. We can not say for sure what went wrong at this point,” Reuters news agency quoted her as saying. The transport minister, meanwhile, addressed questions over why the flight was allowed to go ahead. “Many people were questioning why the plane took off in typhoon weather… according to my understanding the meteorology data showed that it met the aviation safety requirements,” Yeh Kunag-shis said. TransAsia, a private airline, flies domestic routes in Taiwan and international routes in North and South-East Asia. The airline has apologized and says it will compensate relatives of those on board.